The American Heart Association and the U.S. Department of Agriculture, among other health organizations, recommend you consume two servings of fatty fish per week. Salmon makes a good choice for these meals as it is high in healthy fats, protein and other vitamins and minerals. Regardless of the type of salmon you choose, it makes a positive impact on your diet. 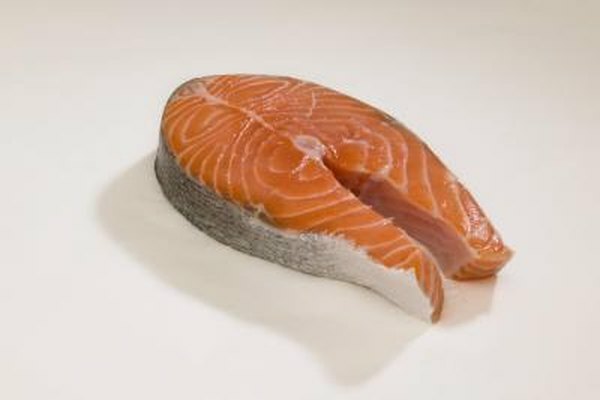 Three ounces of farmed, Atlantic salmon cooked without added fat contains 175 calories and 10 g of fat. It provides 19 g of protein and no carbohydrates or fiber. Salmon is rich in B vitamins with 34 percent of the recommended dietary allowance for niacin, 27 percent for vitamin B6, 19 percent for thiamin, 7 percent for riboflavin and folate and 40 percent for vitamin B12. It provides 21 percent of the RDA for phosphorus and 50 percent for selenium. Salmon is rich in omega-3 fatty acids, which may help protect you against heart disease and many other conditions including Alzeheimer’s disease and stroke. A study in the November 2009 issue of the "Journal of Cardiovascular Pharmacology" noted that omega-3s also have anti-inflammatory effects. Reducing overall inflammation can help reduce blood pressure and may contribute to lower cholesterol levels. Omega-3s are valuable to fetal development and the brain function of people of all ages. The Harvard School of Public Health identifies poultry and fish as the best animal protein sources. They also report that eating more than 18 ounces of red meat per week increases your risk of developing colon cancer. Red meat, such as beef, lamb and pork, as well as dark meat poultry with the skin, often contains high amounts of saturated fat, which contribute to your risk of developing heart disease. The Food and Drug Administration worries that some international farmers feed salmon unapproved drugs in their feed. Farmed salmon can be higher in omega-3 fatty acids than wild caught, but it contains fewer amounts of other nutrients including selenium, protein and B vitamins. Farmed salmon also contain more chemicals in their flesh, some of them known carcinogens, although the levels are still well below levels deemed dangerous by the FDA. Salmon is as easy to prepare as beef or chicken. Simply roast filets sprinkled with salt and pepper in a 400 degree F oven for 15 to 20 minutes, until cooked through. Salmon may also be grilled or broiled. Finely chopped salmon mixed with egg white, bread crumbs and seasoning can be formed into patties and sauted to create a burger. Pub Med.gov: Fish Oil and Heart Health.